I’m normally not someone that writes blogs but quite often I get asked about projectors, screen, displays, monitors, TV etc. However, I believe lots of people are a little confused between resolution and screen ratio. Last week I got told from an old school friend that 16:9 is better than 4:3. “I’m not quite sure what you mean” I told him, do you mean you prefer the ratio 16:9 VS 4:3 or do you think the quality (resolution) is better on a 16:9 screen? 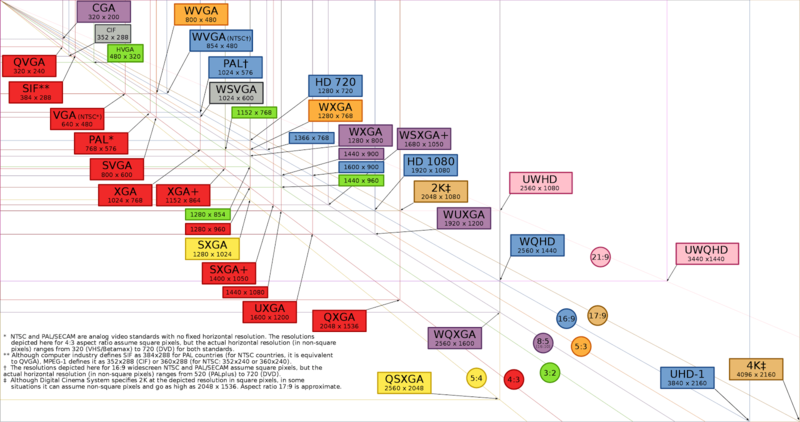 He told me that “a projector that projects an image on 16:9 is higher resolution than a projector that projects a 4:3 image as 16:9 is WXGA and 4:3 is XGA”. The aspect ratio of a screen/image can be 4:3, 16:9, 16:10 etc. and is the relationship between the width and the height of the screen/image. Doesn’t matter how big or small the screen/image is, and if it is in mm, cm, metres, inches etc if the width is divided into units of equal length (for example on a 16:9 is divided by 16) and the height is measured using this same length unit, the height will be measured to be 9 units. The display resolution of a projector, Digital TV, computer monitor etc, is the number of pixels in each dimension that can be displayed. This is to put it in a very simple contest and explanation, so even my friend can understand it! Another meaning of “display resolution” is for displays such as plasma display panels, LCD, DLP projectors and similar technologies, and is simply the number of columns and rows of pixels creating the display (e.g. 1920 × 1080). So to end this brief blog, if you like an image 16:9 better than a 4:3 because you like that ratio better, that’s great but remember a 4:3 image can be of higher resolution that a 16:9 image, for example UXGA (1600 x 1200) 4:3 image VS HD720 (1280 x 720) 16:9 image.